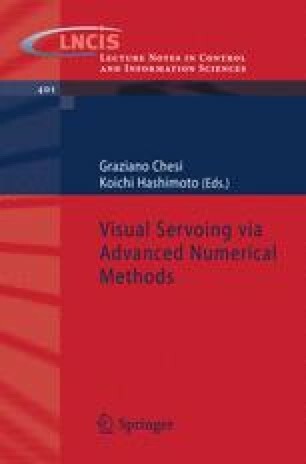 This chapter outlines a generic method to the analysis of eye-in-hand position-based or image-based visual servos. This analysis is said to be “multicriteria” as both the convergence and the fulfillment of important constraints can be assessed, including the target visibility, the avoidance of actuators’ saturations, and the exclusion of 3D areas. The field of nonlinear “rational” systems is first shown to constitute a sound and versatile framework to the problem. The fundamentals of a solution based on Lyapunov theory are overviewed next, together with the noteworthy difficulties raised by robotics. Constructive results are finally presented, on the basis of biquadratic or piecewise-biquadratic Lyapunov functions, leading to feasibility/ optimization programs subject to linear matrix inequalities (LMIs). A case study illustrates the approach.